You can read the complete letter to Senator Stabenow here. Credit monitoring company Equifax announced last Thursday (Sept. 7) that they experienced a data breach that exposed credit information for approximately 143 million individuals. This information included the person's name, social security number, date of birth, current and previous addresses, and potentially their driver's license number. Approximately 182,000 individual's credit card numbers were also exposed. The breach is still under investigation, and these numbers may change as more information is discovered. Equifax has a website with information surrounding the breach. You can check if you were affected by the breach by either following the "Potential Impact" link at the top of the page or enrolling in their free credit monitoring service by clicking the "Enroll" link. We suggest that affected users consider issuing a freeze on their credit accounts. Brian Krebs, a well respected information security expert, has written an excellent article describing a credit freeze and how to achieve it.. The article can be found here. Note that this will also prevent anyone from checking your credit for legitimate purposes—like applying for a loan—unless you temporarily unfreeze your credit. As with all highly publicized news items, this breach will lead to an increase in the number of phishing attacks. Attackers often use the hype surrounding these events to trick people into turning over their credentials or other personal information. It is important that everyone continues to be extremely cautious when dealing with email or phone messages that claim to be Equifax or some other credit-related business. If you receive a suspicious email or call, report it to it-help@mtu.edu, and we would be happy to attempt to validate it for you. The second week of each semester, Michigan Tech tests its emergency communications system, Safety First Alert. This fall's test is scheduled for 11 a.m. tomorrow, (Sept. 12). You should receive an email, a text message and phone calls on your registered phones. To sign up or update your Safety First Alert information, go here. Members of Michigan Tech's Presidential Council of Alumnae (PCA) will be on campus Sept. 21 and 22 when they will meet with faculty, staff and students to share career advice, conduct roundtable discussions and participate in annual meeting activities. PCA members are graduates of Michigan Tech who have been recognized for personal and professional achievements including education and career excellence, community involvement and volunteerism either as a student or alumna. Members meet annually on campus for activities that support the University's strategic plan and focus on engaging the campus community to educate, influence and inspire the women of Michigan Tech. To promote and enhance student career success, PCA is partnering with Career Services. Students are invited to join PCA for lunch and a lightning talks program on Thursday, Sept. 21 and then a breakfast with keynote speaker Brenda Ryan (who is a member of the PCA and the Michigan Tech Board of Trustees) on Friday, Sept. 22. Following the keynote, PCA members will conduct roundtable discussions to address student's needs as they prepare for and seek out career opportunities such as internships, co-ops and professional positions. Career Services will send email invitations to students during this week. Ryan will also engage with PCA members and some faculty and staff for an informal discussion along with Q & A on her career path, challenges and rewards, and entrepreneurship in the primarily male dominated remanufacturing industry. For questions or more information, contact Paula Nutini, director of stewardship and annual giving or call 7-3609. The next semi-annual free sale is from 11 a.m. to 3 p.m. Saturday, Sept. 23 at the Meese Center. Consider donating your gently used, clean women's business clothing and accessories. Your items will be available to all Michigan Tech students at no cost. Items remaining after the event will be donated to a local non-profit or held for a future event. This is the sixth free sale event—a giveaway of gently worn women's business clothing for students. These events are typically held the weekend before Career Fair and have been met with great success, helping more than 250 students while giving out more than 95 percent of donated items. Want to volunteer and join the fun? Contact Jeannie DeClerck or Tess Ahlborn for more information. The six-week Foundational English Program takes place beginning today (Sept. 11) through Oct. 20. This program is designed for people who would like to learn English from the basic or beginning level in order to participate more fully in the community or eventually pursue higher education. Community members or family members of graduate students/ faculty are welcome. You may select individual courses (three hours a week) at $360 per course or all courses (12 hours a week) at $1,440. The four courses offered are Listening and Speaking, Reading, Writing and Integrated Skills: American Culture. Through these courses, learners will develop vocabulary and pronunciation skills, experience American culture, connect reading and writing, reinforce listening and speaking strategies, and practice English conversation. All courses are taught by highly-qualified and supportive ESL instructors. If you would like to enroll in this program, email Heather Deering or call 7-2009. A Michigan Tech student and a high school senior are working together to introduce middle and high school girls to computer programming. Sarah Larkin-Driscoll a first-year computer science major and Houghton High School's Miriam Eikenberry-Ureel are presenting a six-week workshop sponsored by an AspireIT grant from the National Center for Women & Information Technology and facilitated by Michigan Tech's Computer Science Department. Girls in grades six through nine participating in the six-week workshop, "Code Ninjas Workshop for Girls: Creative Programming" will learn to program a 3D scene, 2D video games and graphic art in the Processing language. They will also learn to program a simple text-based program in Java and a music video in Scratch. They will learn how to combine basic shapes and animation to create a game or scene of their choice. The workshop will focus on career and educational opportunities and ways participants can use their computer skills in a variety of settings. Workshop sessions will focus on teaching girls how to program computers in a fun and creative environment. Additionally, programmers from industry and academia will discuss their experiences. We will also have guest speakers talk about the importance of copyright and patents. No prior programming experience is necessary. Classes will take place in Rekhi Hall, Room 112 on the Michigan Tech campus. Register here, but hurry space is limited and early registration closes Wednesday. The Goal 3 Global Literacy Committee will host a webinar open to all interested faculty entitled Webinar: Global Learning Beyond Study Abroad on Tuesday, September 12 from 2- 3 p.m. in EERC (Room 501). The webinar will feature examples for integrating global learning into all levels of higher education, at institutions of all types and sizes, as a core component of higher education. Panelists from AAC&amp;U, Florida International, Worchester Polytechnic, and Babson will share frameworks, practical techniques, and proven strategies for institutions to integrate global learning across the curriculum. More information on the webinar is available here. Three Michigan Tech alumni are revolutionizing university recruitment for eight million students across the country with an innovative career platform known as Handshake. Handshake was founded by Garret Lord, Scott Ringwelski and Ben Christensen, engineering students at Michigan Tech, in 2014. Frustrated with the challenge of living in Houghton and trying to find access to internships, companies and recruiters on the West Coast, they created a web-based platform that would easily connect students, career centers and recruiters online. Handshake is now a rapidly growing company based in San Francisco serving more than 400 universities with more than 200,000 recruiters looking to hire students and recent college graduates nationwide. On Aug. 24, Handshake launched Handshake Mobile and a new online user interface to make it more convenient for students to find job opportunities, receive recommendations, and connect with recruiters and career centers. The new platform provides recommendations based on a student's interests, skills, major, location preferences and search history. Four hundred and fifty-two new jobs were posted on Handshake last week, with opportunities in engineering, business, forestry, humanities, IT, and more. "We want faculty and staff to encourage students to utilize this resource," says Kirsti Arko, associate director of career services, "Only forty percent of current, active students at Michigan Tech have even logged into Handshake." Handshake boasts "representation from 99 percent of the Fortune 500 including top financial institutions, cutting edge tech companies, leading design and marketing agencies, and nonprofits saving the world." Career Services will offer a Handshake Genius Bar support service to students from 10 a.m. to 5 p.m. today through Friday (Sept 15) in the Career Services Lobby of the Admin Building. Staff is on hand to help students set-up a profile, upload a resume, register for events, apply for job opportunities and prepare for Career Fair. The first 50 students to arrive at the event will receive a Handshake Genius T-shirt. The University Senate will meet at 5:30 p.m. Wednesday (Sept. 13) in Dow 642. Senators are responsible for making their constituents aware of the agenda for this meeing. Senators who are unable to attend should arrange for their alternated to attend in their place. The Rozsa Center for the Performing Arts is looking for new volunteer ushers. This is a great way to meet people in the community and it's a chance to see some of our fine productions free. There will be a training session at 6:30 p.m. Friday, Sept. 22 in the Rozsa Center lobby. Volunteers will receive detailed training on the duties of an usher and a tour of the facility. Free pizza will be provided at the end of the session. Anyone 16 years and up can volunteer. If you have any questions or would like to sign up, contact the front of house coordinator at shoover@mtu.edu. Are you interested in improving your public speaking skills? Need a place to practice your speeches and receive valuable feedback from peers? Join the Keynote Speakers Club and learn more about the club. The first info session will be from 6 to 7 p.m. tomorrow (Sept.12) in EERC room 100. The group will meet every other Tuesday at the same time and location. Outdoor Yoga with HuskiesFit, 7 p.m. on the Walker Lawn. Bring your own mat. This is a free event and all are welcome. (Rain location is MUB Ballroom). Health Fair, 4-6 p.m. MUB Ballroom A. Therapy dogs, nacho bar, student incentives/prizes, giveaways, free screening performed by students, free massages and more. This is a free event and all are welcome. More information on any of the Week of Wellness events is available online. C-Cubed lunches return this Thursday and Friday, from 11:30 a.m. to 1:30 p.m. in the Memorial Union Alumni Lounge. The Michigan Tech football team fell short 31-27 at Hillsdale College in a non-conference contest Saturday afternoon. The Huskies carried a 27-10 lead into the fourth quarter, but the Chargers rallied with 21 unanswered points in the final 15 minutes to pull out the win on their home field. Defensively, sophomore linebacker Marvin Wright led the team this week with nine tackles, one sack, and two tackles for a loss. The Huskies will look to rebound on Saturday when they return to the friendly confines of Sherman Field to battle Grand Valley State in the Great Lakes Intercollegiate Athletic Conference opener. The game will be streamed live on ESPN3 and will also be available on the ESPN app. One lucky fan in attendance will also have the chance to win a $25,000 vehicle courtesy of Keweenaw Chevrolet at halftime of Saturday's contest. The kickoff is scheduled for 1 p.m. For the full story and more on Michigan Tech sports, visit michigantechhuskies.com. The Michigan Tech soccer team soccer team suffered a 3-1 loss in a hard fought non-conference match against Minnesota Duluth yesterday afternoon at Sherman Field. The Huskies fell behind 2-0 early in the second half, but closed the gap to one and stayed on the heels of the Bulldogs until the final minutes. "I'm really proud of my team and how they played," Michigan Tech Head Coach Michelle Jacob said. "They showed a lot of character out there today after suffering the amount of injuries that we did. They never stopped fighting and kept playing hard and working for each other. I think that speaks volumes for the kind of people we have in this program. I thought we gave them a great game and proud of what we put out there." Tech remains at home for a match with Northwood, Friday at Sherman Field. For the full story and more on Husky sports visit michigantechhuskies.com. Teaching at Tech Luncheon Workshop - Office Hours: How Do I Get Students to Attend - and Be Most Effective When They Do? As students expect more "personalized learning," office hours are an increasingly important place to address questions, offer alternative resources, and hear student feedback. Yet many instructors find they rarely have student visitors, regardless of the number of times they make an invitation. In this luncheon workshop, we'll examine how to break down barriers to attendance and use time efficiently and effectively when students do attend. Join us at noon Tuesday, Sept. 19, for this luncheon workshop. Lunch will be provided to those who register by Friday (Sept. 15). Students planning on finishing a dissertation, thesis, or report in fall 2017 are invited a seminar designed to help students understand the submission process and answer questions about it. Faculty and staff who assist students with submissions are also welcome to attend. See the full Tech Today story here. Catherine Fisk of the University of California-Berkeley will be on campus for a pair of events Wednesday. At 4 p.m. she will present her take on collective organizing among the creative classes. The presentation is in the East Reading Room of the Van Pelt and Opie Library (note location change). Light refreshments will be served at 5:30 p.m. The lecture is sponsored by the School of Business & Economics and the Visiting Women And Minority Lecturer/Scholar Series (VWMLS) which is funded by a grant to Institutional Equity and Inclusion from the State of Michigan’s King-Chavez-Parks Initiative. At 6 p.m., also in the East Reading Room of the Van Pelt and Opie Library, Fisk will present a Constitution Day speech, "Free Speech on Campus." Refreshments will precede the talk at 5:30 p.m. All attendees will receive a free pocket Constitution. Volunteers are needed for the Parade of Nations Saturday (Sept. 16). Tasks include: parade line up, directing parade traffic, transporting flags and supplies to storage, clean up during and after the Multi Cultural Festival. If you're interested in volunteering, register to volunteer here. If you have any questions contact Vienna Chapin. The Applied Cognitive Science and Human Factors (ACSHF) forum will be held from 2-3 p.m. today (Sept. 11) in Meese 109. Elizabeth Veinott (CLS) presents "Person, Cognitive and Situation Factors in the Psychology of Deferred Decisions." Read the original Tech Today story. In an Op-Ed piece in the Detroit News, University President Glenn Mroz encouraged states to spend more money on higher education. Read the piece here. The American Geophysical Union's (AGU) Blogosphere reported on a new study by the Michigan Tech Research Institute and others, showing that a growing number of wildfire-burned areas throughout the western United States are expected to increase soil erosion rates within watersheds, causing more sediment to be present in downstream rivers and reservoirs. See the full story here. Porsche Auto World published a story about Michigan Tech's Automotive Industry Day on campus last week. Industry days are part of CareerFEST, events surrounding and leading up to the Fall Career Fair on Sept. 27. WJMN TV3/UPMatters reported on the upcoming Parade of Nations and Multicultural Festival this Saturday (Sept 16). See the story here. 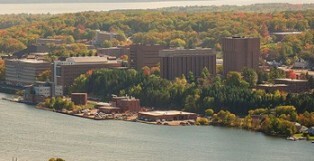 Michigan Tech IT is always looking for ways to improve our service in order to support your success. Provide us your feedback via the ticket resolution survey or by completing a survey at the following link. This is an extremely busy time of year for the campus community and we want to do our best to ensure everybody’s success. In addition to our support staff, we have an online support center. This web site has answers to a variety of IT-related questions you can search by keyword. We are continually improving this site. Again, if you have any questions or would like to provide us feedback, contact us at it-help@mtu.edu or call 7-1111.